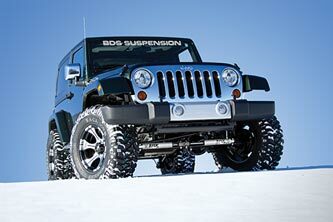 BDS Suspension is now offering redesigned dual steering stabilizer kits for the 2007-2016 Jeep Wrangler JK. These new stabilizer kits are designed to improve your Jeep's overall drivability by reducing the front end shimmy caused by oversized tires, keeping you in control on and off-road. 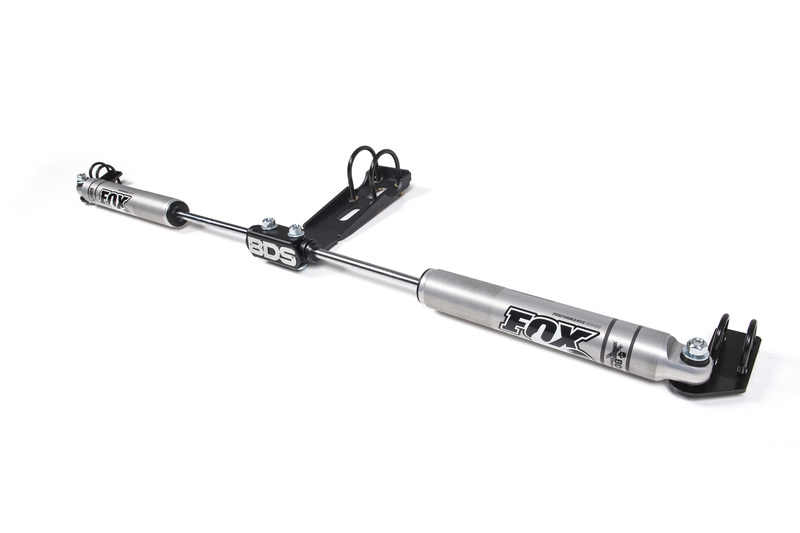 Kits are available with your choice 5500-series, 9500-series, and FOX 2.0 steering stabilizers for improved performance. Check our website or verify details prior to ordering parts to ensure information is up to date with current manufacturing offerings. JK Dual Steering Stabilizer Kits: BDS Suspension now offers updated dual steering stabilizer kits for the late model 2007-2016 Jeep Wrangler JK. These new dual steering stabilizer kits join the existing OE replacement single and high-mount single stabilizer kits currently available giving you several options to eliminate the front end shimmy caused by oversized tires on rough terrain. These new dual steering stabilizer kits use a redesigned center mount built from ultra-strong 1/4" steel, finished in a durable black e-coating with a riveted stainless steel center BDS badging. 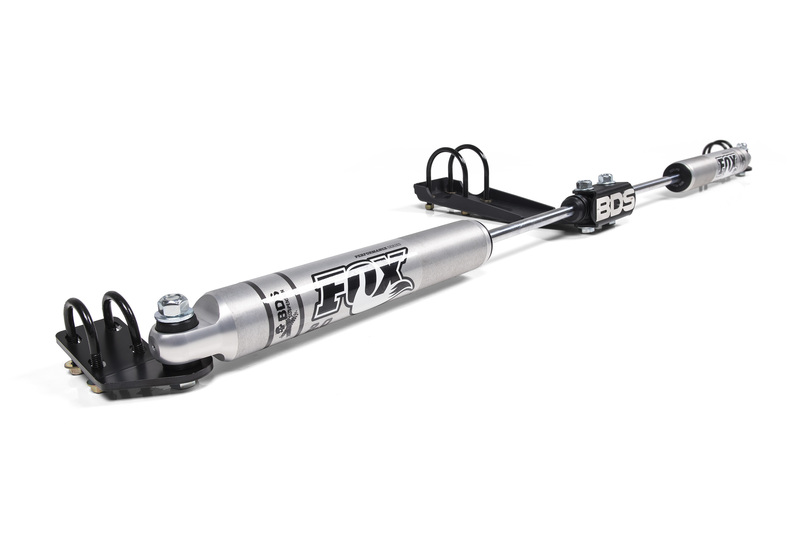 The steering stabilizer kits are 100% bolt-on. The center bracket uses u-bolts to mount to the axle while the outer brackets mount to the tie rod ends. For stabilizer cylinders BDS offers 3 options, the white bodied 5500-series hydraulic cylinders, the brushed stainless bodied 9500-series cylinders, and lastly the aluminum bodied FOX 2.0 gas charged cylinders. 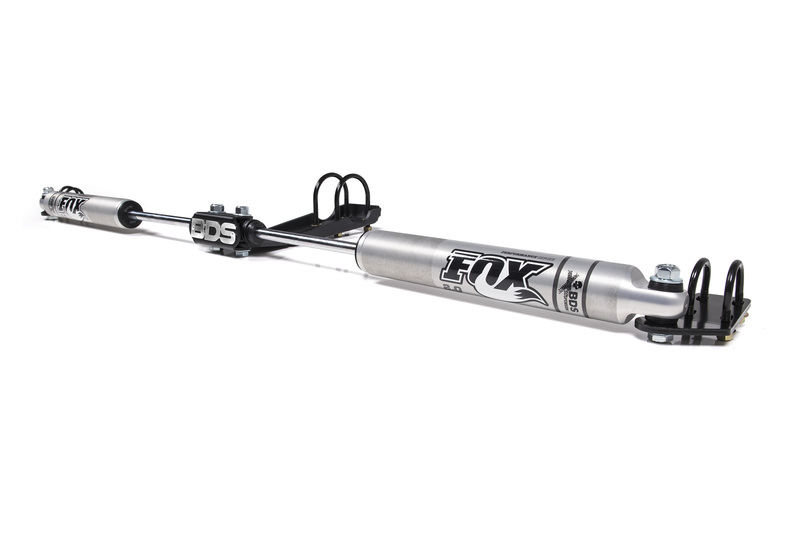 The FOX 2.0s feature 50/50 gas pressurized cylinders for superior dampening and superior handling feel. 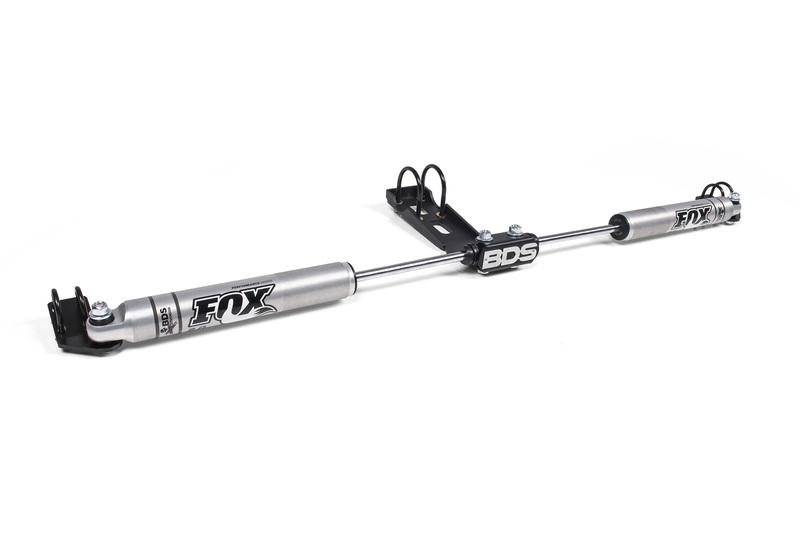 For more info on these new steering stabilizer kits for the Jeep Wrangler JK and to find a dealer near you, head online to bds-suspension.com or call (517) 279-2135. Click image to view and save high-res image. I have the 5500 series, I need to up grade the tie rod. I’ve just replaced the shocks. What’s recommended? I have a 1985 CJ8 Scrambler. Do you offer the dual steering stabilizer for this model of Jeep? I bought the dual steering stabilizer p/n 55378 for my 2016 Wrangler Jk but I am using a Teraflex HD tie rod and the brackets to connect the shocks to the tie rod do not fit. What do I do? Do you sell brackets for HD tie rods ? Did you find the brackets I have the same issue I have the HD teraflex tie rod end but my dual stabilizer doesn’t fit anymore does anyone sell these bigger brackets? thanks for your interest in BDS Suspension. Unfortunately we don’t offer manufacturer direct international retail sales so I’m not able to help you with pricing. Along with that we don’t currently have any distributors in Australia. Your 2 options would be to purchase through one of our current distributors willing to export the parts to Australia OR use a freight forwarder that could provide you with a US ship-to address to purchase off our website. 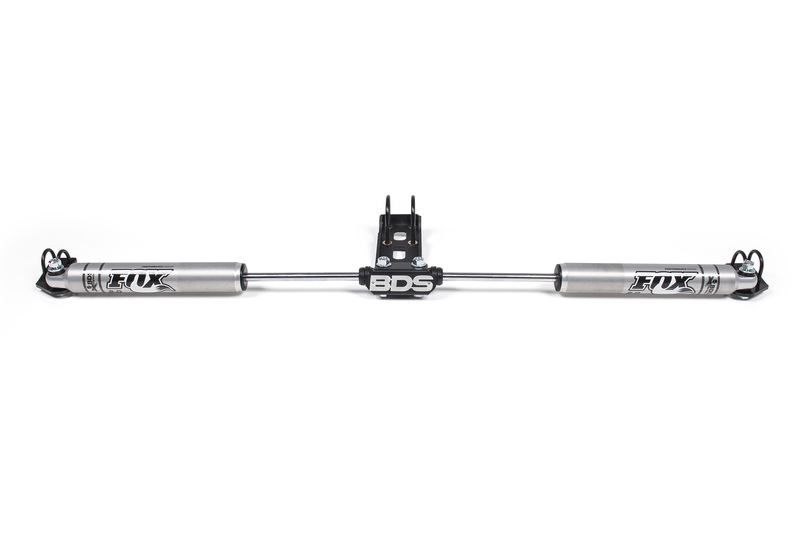 I had the bds dual steering stabilizer installed on my 13 Jeep Jk and it keeps rotating downward I have no idea why neither does the place that installed them. Mine did the same thing look at your end brackets mine were on the wrong side they have to face outwards. this particular JK from the announcement is running the BDS 4″ Lift Kit on 35″ tires.